I remember when loads of bloggers were raving about ANGELOLOGY by Danielle Trussoni. Part of me wanted to read it because it was so popular, but another (and maybe bigger) part of me thought it sounded like a book that I wouldn't appreciate. As many of you already know, I love thrillers and enjoy the occasional historical fiction, but I am not a huge fan of fantasy and the supernatural. So I decided to pass on ANGELOLOGY. Fast forward to March of this year when I learned that the sequel to ANGELOLOGY -- ANGELOPOLIS -- is ready to be released. I read a few blogger reviews of this new novel and saw that it was getting some great buzz too, and I decided that maybe I should re-think my initial impression of the books. So late last week, I picked up ANGELOLOGY and found that I couldn't put it down. Much to my surprise, I loved this novel! You could have knocked me over with a feather! ANGELOLOGY is part mystery/thriller, part historical fiction and part love story. I will attempt to summarize the story; however, I warn you that the next few sentences only begin to scratch the surface of this compelling novel. You honestly need to read it for yourself!!! The story begins with Evangeline, a young nun who is part of the Franciscan Sisters of Perpetual Adoration and works in their library. When she receives a request from a man who wants access to their records to see if there is any correspondence between the late mother superior and Abigail Rockefeller, she pens their regular response that they don't allow outsiders access; however, something stops her from actually sending the letter. For some reason, Evangeline's interest in this stranger's letter is piqued. She begins looking around and, much to her surprise, finds a 1943 letter between the two women that offers more questions than answers. Evangeline begins her own sort of investigation that throws her into a world of secrets. She discovers that there has been a long-time on-going conflict between a secret society of Angelogists and Nephilim, the descendants of angels and humans, that she is destined to join. As Evangeline learns more about the history of the convent as well as her own relatives and the parts they've played in this war, she finds that she must walk away from the security of the convent and venture out into this dangerous new world. I admit that ANGELOLOGY really amazed me. Not only was I not really expecting to like it, but I actually thought the description made the book sound a little strange. As someone who doesn't read a lot of books with supernatural elements, I have to say this story was very believable. I immediately got caught up in Evangeline's story and everything was presented so well that I never even questioned the reality of what was happening. I guess what I'm trying to say is that the very complex story was so well thought out and everything just came together so smoothly. That's a huge testament to this author's storytelling abilities. Another aspect of this novel that I really enjoyed was how well it went back and forth between the various characters' stories as well as how well it transitioned between the present and the past. I loved both the present day stories and the past ones, and I was extremely impressed with how effortlessly the story moved between them. I also liked how much ground ANGELOLOGY covered. It was also very apparent to me that Ms. Trussoni did a huge amount of research prior to (or while) writing this novel. I appreciated the details about present day convent life, but I also enjoyed so much of the history of the Middle Ages and the Nazi regime as well all of the biblical references. In addition, I loved the thriller aspects of the story -- and boy were there a lot of suspenseful moments. 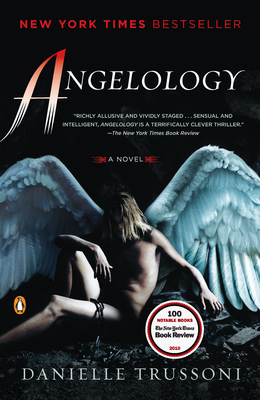 I read a fair amount of mysteries and thrillers each year, and I've found that ANGELOLOGY ranks right up there with my favorites of 2013. I don't want to give away too much about the story, but suffice it to say that Evangeline's (and her friend's) involvement in this long-time conflict was incredibly intriguing. The author did a fabulous job of making it suspenseful and keeping it suspenseful (which is much harder to do in my opinion.) In addition, I loved how I was managed to be surprised numerous times during this novel! I seriously could go on and on about many more terrific things about ANGELOLOGY, but I won't! I feel as if my review has only scratched the surface about the depth of the story and I'm certain that I haven't done it justice. My hope is that I've at least given you enough to tempt you to read it. And if you've already read it, then you know what I'm talking about! If you are looking for a very smart and entertaining book that's a little different than your typical book club fare, then you might want to consider selecting ANGELOLOGY. There is a reading guide available with ten interesting discussion questions that's included in the paperback version of the novel. Some of the themes you might want to explore include secrets, the role of angels, war, betrayal, sacrifice, salvation, vows/promises, obligation, and religion. In addition, I think it might be fun to delve into the characters' actions and motivations. Needless to say, I adored ANGELOLOGY and I can't wait to read the sequel ANGELOPOLIS! Giveaway alert: I have a copy of ANGELOLOGY and the sequel ANGELOPOLIS to share with one lucky reader! To enter, just fill out the form below before April 2nd at 11:59 p.m. ET. I will randomly select and notify the winner the following day. This contest is open to those of you with U.S. addresses only. Good luck! I know, I really didn't think this would be my type of book, but I listened to the audio and really enjoyed it. It DID get a little hokey at the end, with all that running around and chasing clues, but overall I was enthralled. I have the second audio, but haven't loaded it yet. I've read them both and loved them. Great giveaway. I've been meaning to read Angelology ever since it came out. Terrific review, Julie! Wow, I remember all those raves too and figured the book wasn't for me. You and Sandy have me wondering.